The Outdoor Solar LED Light Pack's are a perfect solution to 'light up' the areas on the exterior of your home, providing comfort and security for you and your family. These lights are great for creating sufficient long lasting light outside your home at night. These lights are easy to install and maintain. Attach to your gutter, fence or wall where the sun will catch full direct sunlight during the day and at night they will automatically switch 'on'. Requires no wires or extension cords. These lights charge by day and turn on/off automatically when the sun rises and sets. Perfect for your home, saving you money on electricity costs! 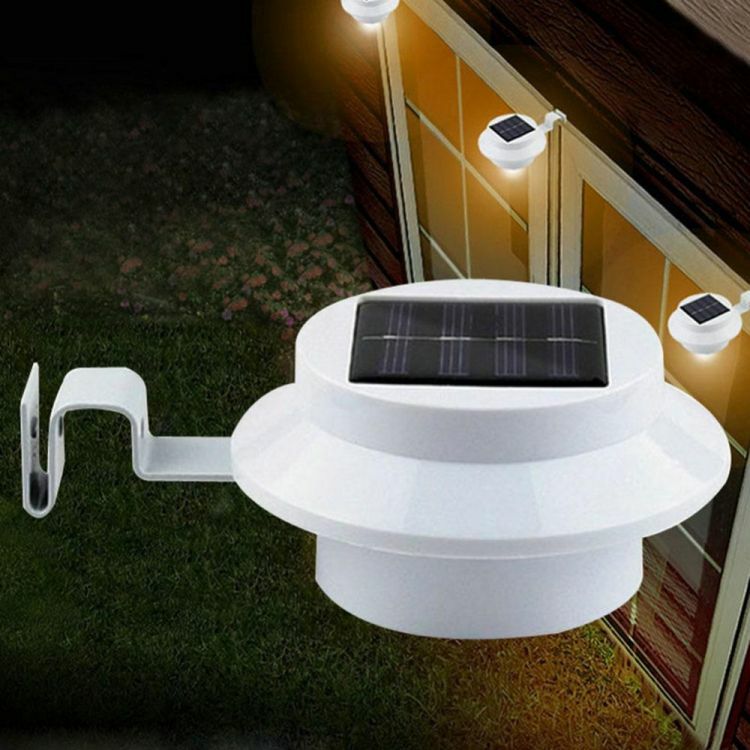 These Solar powered LED gutter lights are perfect for your home and garden. These lights are great for creating sufficient long lasting light outside your home at night. These lights are easy to install and maintain. Attach to your gutter, fence or wall and they watch them light up perfectly. Requires no wires or extension cords. These lights charge by day and turn on/off automatically when the sun rises and sets. Great for your home! Light up the outdoors with these fantastic solar gutter lights! Save money and energy with this eco-friendly garden light! Time of illumination: Up to 6 hourCharging time: 4-6 hThese Solar powered LED gutter lights are perfect for your home and garden. These lights are great for creating sufficient long lasting light outside your home at night. These lights are easy to install and maintain. Attach to your gutter, fence or wall and they watch them light up perfectly. Requires no wires or extension cords. These lights charge by day and turn on/off automatically when the sun rises and sets. Great for your home!The Outdoor Solar LED Light 4 Pack are perfect for your home & garden. These lights are great for creating sufficient long lasting light outside your home at night and also for security. These lights are easy to install and maintain. Attach to your gutter, fence or wall where that area will recieve full sunlignht and then watch them light up at night time! Requires no wires or extension cords. These lights charge by day and turn on/off automatically when the sun rises and sets. Perfect for your home! Light up the outdoors with these fantastic solar lights! Quantity: Sold in Pack's. See below for great deals, the more you buy, the more you will save $$$! 6 PACK (54% OFF! $62.02- was $134.82) + FREE SHIPPING! 8 PACK (59% OFF! $73.70- was $179.76) + FREE SHIPPING! 10 PACK (65% OFF! $78.65- was $224.70) + FREE SHIPPING!